No, Asus hasn’t just released a range of crappy lappys. In fact, it’s quite the contrary. The Asus F6 laptops (with matching mice) not only look good but they smell good too (apparently), joining the likes of the iCool MP3 player and the chocolate scented calculator in the smelly technology department. There are four designs to go for that exude an assortment of distinct fragrances depending on the one you choose. Having a mental breakdown at your laptop? Perhaps the sweet floral scent of the florally decorated lappy (right) will calm you down? If you’re not a fan of floral scents, maybe the musky scent of the graffiti inspired Musky Black laptop will float your boat? The latter two laptops don’t sound as delicious and flavoursome, in fact, they sound quite off-putting – the Morning Dew, inspired by respect and love and the Aqua Ocean, with a scent that’ll make you feel like you’re on a beach (I wonder what beaches they’re basing this on?). Potency levels are unknown, so it’s unclear whether the scents will be overpowering to the nose or just the right level of aroma to prevent you having a grumble. It’s not just about being a fashion accessory. If you’re not that turned on by the pretty motifs/smell factor, the specs are pretty darn decent. 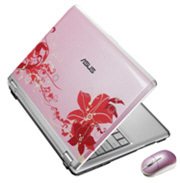 The Asus F6 features a fingerprint scanner for ultimate security, an Intel Core2 Duo processor, 256MB DDR2 VRAM, runs Windows Vista, and has a 13.3-inch display.